Aurion Gold Nanoparticles – Carboxyl Functionalized – are polyethylene glycol-carboxyl stabilized gold nanoparticle solutions based on defined particle sizes of 6, 10, 15 and 25nm. They are prepared using in-house developed production protocols giving the product a narrow size distribution, long term stability and optimal conjugation properties. Biomolecules having primary amines available can be covalently conjugated using EDC/ sulfo-NHS chemistry. Biomolecules that are too small to be conjugated to Gold Nanoparticles via adsorption can be covalently linked to Carboxyl-functionalized Gold Nanoparticles. Primary amines are present in e.g. the N-terminal side of peptides and in the side group of the amino acid lysine. The conjugation relies on well known and proven EDC/ sulfo-NHS chemistry. EDC (N-(3-Dimethylaminopropyl)-N’-ethylcarbodiimide hydrochloride) is a water soluble carbodiimide which transforms the carboxyl groups on the gold to an active ester in the presence of sulfo-NHS (N-Hydroxy- sulfosucciimide, sodium salt). These sulfo-NHS esters are relatively stable in acidic environment and couple rapidly to the amine(s) in the target molecules. They are available in size ranges 6, 10, 15 and 25 nm. The particle population is monodisperse and thus shows minimal size variation and overlap. Typically, the coefficient of variance for the 6 and 25 nm particle size sols is less than 12%, whereas the 10 and 15 nm size sols show less then 10% variation. Actual lot specifications (size, variation and expiry date) are indicated on the accompanying package insert. 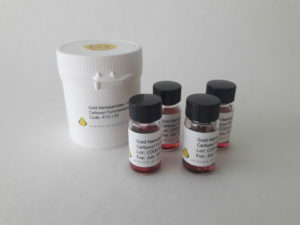 Package size: 4×5 ml of high quality Carboxyl-functionalized Gold Nanoparticles at an OD520nm = 1.0. Aurion Gold Nanoparticles – Carboxyl Functionalized – have a guaranteed shelf life of 12 months from the date of quality control analysis. Detailed instructions for covalent conjugation, purification and evaluation are described in the package insert.